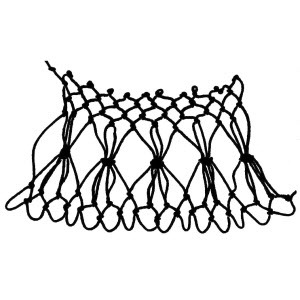 Net one knot in each loop. Net one knot in each loop. Without mesh stick net together loop formed by CK and loop to the right of CK, in same loop, now using mesh stick net 2 more knots, *net next 2 loops together, in same loops net 2 more knots (total 3 knots in 2 loops)*; repeat from * to *. Net 2 loops together, in same loops net 2 more knots (total 3 knots in 2 loops); repeat. 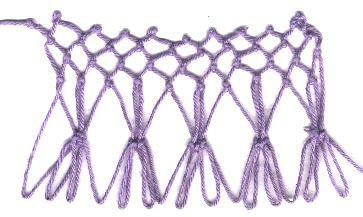 The amount of increase can vary depending on how many knots are net in 2 loops in round/row 2. Any number greater than 2 will increase the number of loops.